Braille display surface design eliminates seams between the cells for a smooth reading surface that feels like paper. Navigation features designed so hands seldom need to move from the braille display. All buttons can be individually configured to set up hot keys for specific functions. 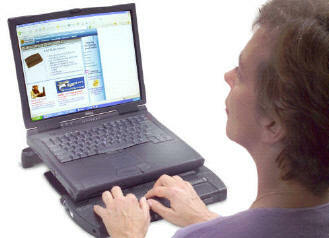 Exclusive Whiz Wheels® to scroll by line, sentence, or paragraph, or pan through a document. Use front panel select buttons in combination with panning buttons, rocker bars, and cursor router keys to select a block of text, page up or down, or move to the beginning or end of a document. 10 dual-purpose hot keys give instant access to many braille and JAWS® commands: enable contracted braille, switch to display modes such as structured and line mode, or perform keyboard commands like TAB, SHIFT+TAB, HOME, and END. For users who like a Perkins style keyboard, simply remove a cover to make available this logical, structured interface to issue navigation, Windows, and JAWS commands without removing your hands from the display. 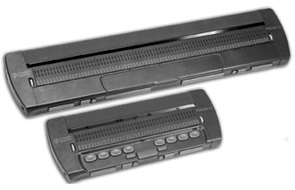 VariBraille allows the user to select the firmness of the braille display. Simple connection: Just plug into a PC or notebook computer via USB. Focus 40: 13.7 in. x 5.3 in. x 1.7 in., 2 lbs., 10 oz. (34.79 cm. x 13.46 cm. x 4.32 cm., 1.19 kg.). Focus 80: 23.8 in. x 5.3 in. x 1.7 in., 4 lbs.